Social studies standards in multiple states require students to become engaged in their communities. For some students, that means speaking out on issues they care about. On February 14, 2018, Valentine’s Day, 17 people — 14 students and three staff members — were murdered at Marjory Stoneman Douglas High School in Parkland, Fla. The attack unleashed a massive national response of mourning, rage, and activism with student walkouts on March 14 and April 20 and rallies in Washington, D.C., and more than 500 other American cities. I teach at Hofstra University on Long Island, N.Y., where a number of local school districts made it possible for students to participate in the actions. On April 20, hundreds of students and staff at Uniondale High School in a Nassau County suburb of New York City wore orange and held a rally on their football field. The anti-gun violence, pro-gun control rally, which was the culmination of weeks of planning by student committees and meetings with teachers and administrators, memorialized those who died not only in Parkland but also in the 1999 mass shooting at Columbine High School in Colorado as well as local gang-related shootings. Since April, at staff development sessions and professional conferences for social studies teachers, I have asked participants how their school and district administrators responded to the student-led protests and to what degree teachers were involved in supporting student protests and walkouts. A number of schools recognized the legitimacy of student action, and in those schools teachers were involved. But almost all the teachers I spoke with were cautious about their own roles unless they had explicit administrative directives, and some questioned whether teachers had any role to play in student-initiated actions. 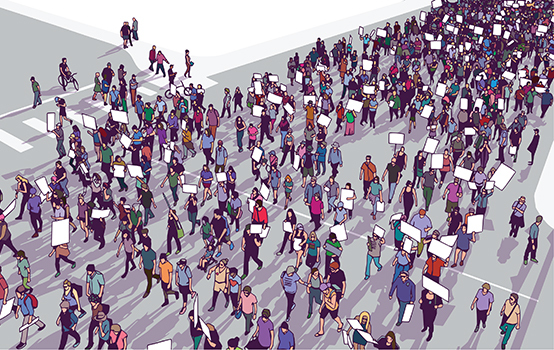 As it turns out, teachers and schools have an important source of guidance when considering whether and how to respond to student activism: the social studies standards. Quite frequently, not only do state standards permit teachers and schools to support student activism, but they encourage student activism as a means by which to develop civic understanding. States have incorporated this idea into their own standards in a variety of ways. For example, the introduction to the California social studies framework explains that “Whenever possible, opportunities should be available for participation and for reflection on the responsibilities of citizens in a free society . . . Students need to take an active role as citizens and know how to work for change in a democratic society” (California Department of Education, 2017, p. 14). How does that play out in practice? Students begin civic education in 3rd grade, when they discuss how and why citizens participate in their communities, and by the end of 8th grade, students are expected to understand how citizens participate in the American political system (Klingensmith, 2000). Schools have a responsibility to respect dissent, but they also have a responsibility to empower students to respond to stereotypes and to protect themselves and one another from unjustified attacks. To promote civic engagement, California teachers are expected to “employ structured group discussions, simulations, classroom debates, and civics-based service-learning activities.” Students can explore various avenues of civic engagement, including volunteering at local agencies, developing environmental projects, serving as poll workers, participating in voter registration drives, attending public hearings, conducting projects related to community problems, and speaking with public officials about issues and policies they care about (California Department of Education, 2017, p. 437). Beginning as early as kindergarten, students in New York State are expected to take part in activities related to issues or problems in their classroom or school. By 4th grade, that vision expands to include community, state, and national issues (EngageNY, 2016). The 10th-grade social studies standards require students to analyze disciplinary-based issues and demonstrate their mastery by taking action to address the issue being studied (EngageNY, 2017b). (Interestingly, these “activism” standards are not linked to Participation in Government and Civics classes, but are for students studying Global History.) The specific aim of the 12th-grade New York State Participation in Government and Civics course is “to provide students with opportunities to become engaged in the political process by acquiring the knowledge and practicing the skills necessary for active citizenship” (EngageNY, 2017a, p. 45). According to the New Jersey Student Learning Standards for Social Studies, all students are expected to “acquire the skills needed to be active, informed citizens who value diversity and promote cultural understanding by working collaboratively to address the challenges that are inherent in living in an interconnected world” (New Jersey Department of Education, 2014, p. 48). The learning standards then define the qualities of active citizenship as making “informed and reasoned decisions and accept[ing] responsibility for the consequences of their actions and/or inactions” and taking “actions that result in a more just and equitable society” (p. 48). Standards that endorse student activism are not limited to “blue states” like California, New York, and New Jersey. For example, the Florida middle school civics standards requires student to research a state or local problem and determine a course of action to resolve it, conduct a service project to benefit the public, and “experience the responsibilities of citizens at the local, state, or federal levels” (Florida Students Achieve, n.d.). Quite frequently, not only do state standards permit teachers and schools to support student activism, but they encourage student activism as a means by which to develop civic understanding. The list goes on. Nebraska is in the process of revising its social studies civics readiness standards to encourage civic participation among students (Nebraska Department of Education, 2018). North Dakota high school students are required to “evaluate the rights and responsibilities of citizenship and civic participation,” including political activism (North Dakota Department of Instruction, 2007, p. 46). In Utah, social studies classrooms are said to be the “ideal locations to foster civic virtue, consider current issues, learn how to act civilly toward others, and build a civic identity and an awareness of global issues. These skills, habits, and qualities of character will prepare students to accept responsibility for preserving and defending their liberties” (Utah Education Network, 2017). In social studies classrooms, Utah students are expected to engage in dialogue about current issues; identify solutions to local, state, national, and international problems, and share their ideas with the appropriate officials. Although social studies standards clearly allow for lessons about how students can express their views and seek change, state and national content-area standards are guidelines rather than prescribed mandates. Faced with proposed student activism, school district and building administrators often prioritize concerns for student safety and discipline over civic involvement. They are also subject to political pressure from school boards and community residents who may oppose particular actions or student engagement in political activities at all. When students begin taking political action at school, the social studies standards can provide an important justification for allowing and even supporting their efforts, but educators also need to be aware of the potential pitfalls of these activities and have a plan in mind for responding should problems arise. For example, whenever students begin considering current issues, there will be differing opinions, and it’s important for teachers to help students carefully consider multiple points of view. Teachers I work with through the Hofstra University New Teachers Network often create classroom “democratic dialogues” that promote reasoned discussion on controversial or sensitive issues (Singer & Pezone, 1997). Teachers provide document packages with differing views for analysis, and students add additional material from their own research. Through the dialogues, students learn to support their own positions with evidence and to listen respectfully and respond to other students’ ideas. The National Issues Forums Institute (www.nifi.org) promotes a similar approach to examining alternative perspectives on such issues as the opioid epidemic and immigration. Resistance to student activism may arise when students have differing opinions and when actions planned by student groups do not have universal support. Resistance to student activism may arise when students have differing opinions and when actions planned by student groups do not have universal support. When I was a high school teacher, I was the faculty adviser to the student Forum Club at one school and to the Gay-Straight Alliance and Palestinian Student Union at another. All three clubs promoted student activism, following open discussion of alternative positions and dialogues with invited speakers expressing diverse points of view. After separate meetings with representatives of Birthright (an anti-abortion group) and the National Organization for Women, students in the Forum Club decided to participate in a rally in Washington, D.C., defending Roe v. Wade and the right of women to reproductive freedom. However, some members of the Forum Club had misgivings about terminating a pregnancy, and I offered them the possibility of working with a local college group that opposed abortion (Singer, 2003). Schools have a responsibility to respect dissent, but they also have a responsibility to empower students to respond to stereotypes and to protect themselves and one another from unjustified attacks. Because activism is educational, teachers and administrators must constantly engage students in discussing and understanding what kinds of actions are appropriate. The Gay-Straight Alliance and Palestinian Student Union both faced particular challenges in this area. The bulletin board belonging to the Gay-Straight Alliance was repeatedly defaced, and the Palestinian Student Union was falsely accused of disseminating pro-terrorist propaganda. In both cases, the groups met with school administrators to decide on appropriate responses, which included forums organized by the groups where they could explain their purpose and goals to other students. Sometimes it’s hard to find the line separating acceptable kinds of activism from those that are not. For example, what if students wanted to organize a club opposing immigration? I believe they should be allowed to, but only if they act in a responsible way that is respectful of others in the school community (including immigrant students). Clubs must also agree that they cannot restrict membership or disrupt the educational process. Clubs or individuals who cannot abide by these rules would be subject to school disciplinary procedures. I also think other members of the school community should be allowed to mobilize to challenge what they may consider to be offensive ideas. And schools should be prepared to forbid the formation of groups (such as avowedly White supremacist or neo-Nazi groups) whose ideology, by definition, attacks inclusion, promotes racism, and rejects dialogue with others. This may require some difficult judgment calls, as well as clear guidelines about what kinds of activities are and are not acceptable, but students will benefit from seeing how responsible adults navigate these challenges. Unfortunately, the United States probably has not seen the last mass shooting incident at a school or place of worship. In response, students will no doubt continue to be socially engaged and politically active as they search for ways to make their communities safer. Students will also continue to find causes that are important for them to speak up about. When this happens, schools, school administrators, and teachers may be called on to support their actions. Social studies teachers have a special role in explaining how administrative and teacher support for student activism is embedded in state standards and helping students understand how to take action in ways that are safe as well as respectful of others in the community. Singer, A. & Pezone, M. (1997). Empowering immigrant students through democratic dialogues. Social Education, 61 (2), 75-77. Singer, A. (2003). Student clubs: A model for political organizing. Rethinking Schools, 17 (4), 22. Citation: Singer, A. (2019). How schools can and should respond to student activism. Phi Delta Kappan, 100 (7), 62-66. ALAN SINGER (catajs@hofstra.edu; @ReecesPieces8) is a professor at Hofstra University, Hempstead, N.Y. He is coauthor (with S. Maxwell Hines and Maureen O. Murphy) of Teaching to Learn, Learning to Teach: A Handbook for Secondary School Teachers (4th ed., Routledge, 2015).